If you ask a Chinese born after 1980 about his or her memories of their first English class, they may probably tell you two names: Li Lei and Han Meimei. These are the names of two virtual characters in the English textbook published by People's Education Press in 1991, which has become a collective memory of the post-1980 generation in China. On douban.com, a Chinese social network site, there is a group called "Li Lei is so awesome. Why Han Meimei doesn't like him," where many internet users share their memories of this "almost love" from their junior high school English textbook. However, if you ask students nowadays the same question, their answers can vary from school to school. With the reform of textbooks, Li Lei and Han Meimei said goodbye to Chinese students in 2001, and a series of new textbooks were published to meet the demand of teachers and students. Schools in different provinces have different versions of textbooks, and their memories of English classes also differ. "I still remember the main characters in my textbook: a Chinese boy Li Ming, a Canadian girl Jenny, and a clumsy but cute dinosaur called Danny," says Yin Xueying from Baoding, Hebei Province, who was born in 1993 and started learning English since the third grade. "The first textbook I used is published by Hebei Education Press." "The very first lesson is about greeting and self introduction, 'Hello, my name is Danny, what's your name?'" she says. "I love Danny most, he loves donuts and always tumbles. Every time he falls, he says 'ouch!'." Different from Yin, 19-year-old Wang Xin says her English textbook is much more boring. "What I can remember now is that there are many Chinese nicknames, like Xiaoming, Xiaohua, Xiaoli, or Ms Wang, but there is no storyline," says Wang. "And I learned how to greet people by saying 'How are you? ', 'I'm fine, thank you. And you?'." Different from Chinese students, many foreign students started their first Chinese language lesson after they enter university. Anastasia, a 20-year-old exchange student from Russia, started to learn Chinese three years ago when she was a freshman. "We start from very simple words, like 'nihao', 'Mama', 'Baba', and also numbers," Anastasia told Metropolitan. "My textbook is published by Beijing Language and Culture University. In the textbook we have Aidehua, which is Edward actually, and Luoma, which is Rome. That's all I can remember." "In the class we usually do grammar, listening and speaking together. These courses are not divided. And we were often amused by learning Chinese," she said. For Katrin from Switzerland, who started learning Chinese five years ago, she still remembers her first Chinese class vividly. "I can still remember the first dialogue is 'Nihao.' 'Nihao.' 'Nihao ma (How are you)? ', 'Wo henhao (I'm fine.)' 'Renshi ni hen gaoxing (Nice to meet you). ', 'Wo ye hen gaoxing (Me too),'" she laughs. "And the characters in my textbook are Li Na and Da Wei." She later added that one of the classes that had the most impact on her is the Chinese idiom "Guai wan mo jiao," which is the literal meaning of going around the curves and skirting the corners, and it implies speaking in a roundabout way. "Western people like to address a problem directly, while Chinese people tend to say it indirectly. The cultural difference from one simple idiom leaves me with a very deep impression," she said. Not everyone has a positive impression of their language learning class. Wang Haozhe, a 22-year-old university student says she feels learning English is difficult. "I think the most important reason is lacking a language environment," Wang said. Xu Yi (pseudonym), an English textbook planner in Beijing, told Metropolitan that a language environment and textbooks are both necessary for language learners and can't be replaced by each other. However, lacking a language environment doesn't necessarily lead to poor performance in language learning. "I think a good textbook should help students cultivate a thinking model of that language. But most textbooks fail in this aspect. 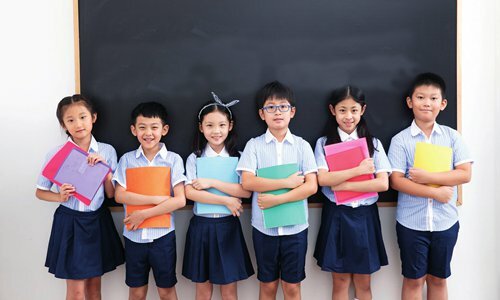 This is one of the reasons why many Chinese students can't master English even though they start learning it from a very young age," Xu said. As a graduate majoring in English language and literature, Yin thinks interest is the best teacher for beginners. A well-designed textbook is like a seed, which can inspire students' interest in language learning. "After so many years, although I can't remember clearly the content of my English textbook, I can still speak out the characters' names and repeat the storylines. It's like a small seed in my heart, which leads me to explore a wider world of language," she says.